I have found that I am the kind of person who (usually) needs structure when performing my role as homemaker & stay-at-home mom. Sometimes I’m totally fine just rolling through the days. Sometimes I hit walls where I feel like I’m not accomplishing anything, my kids are whiney, and I’m doing my best to just stay in some kind of good mood. I have found that there are a couple of things that help me avoid these negative days. The first is to keep a minimum level of order in my home. If clean clothes are in my closet, clean dishes are in the cupboards, and stuff isn’t scattered around the floor, then I’m generally very chipper. Think of your job as a job. Just having this mindset helps me in so many ways. Even if I’m not planning on going out, I daily get up and showered, get dressed, and do my hair and make-up. I think of my husband as a boss/coworker and treat him accordingly (a.k.a. no calling your husband at work to whine and complain about everything). I set goals throughout the day such as having me, the kids, and the dog all fed and ready for the day by 10:00 a.m. along with the kitchen cleaned and laundry started. If I didn’t think of my job as a job, I probably wouldn’t care about things like this. I need three things done regularly in my home that will send me down a depressive spiral if they are not done daily. First, I must have a clean kitchen. So, dishes are done after every meal. Second, I hate tripping on things, so stuff gets put away throughout the day (or in one giant sweep at night). Last, I will become mega-exasperated if it takes me more than 10 minutes to put an outfit together in the morning because laundry isn’t done or it’s sitting clean in a giant pile. So, I (try to) do laundry every day. Clean toilets, vacuumed floors, cobwebs… these things don’t effect my psyche so they can slide a bit here and there when we get busy. Have a brain dump at least once during the day – transfer everything swimming around in your head on to paper. I keep a running To-Do list on my computer and I keep lists of projects, dreams, & art in a sketchbook. If I have too many things in my head I start to get paranoid that I’ll forget them, so dumping them onto my lists helps me to prioritize. I want to spend my time on what really matters, not on what is making me stressed at the moment. The key is to just plan something… Write a set-in-stone schedule, but keep it soft as clay. Consult Resources: I’m always looking for ideas of things to do with my kids. I’m usually laid back about when to do the activities, but do try to set up lots of things to do in my house so that they are ready to go when inspiration strikes. I use a list I put together of activities to do with toddlers (ThingsToDoList.pdf) that I will look at when I don’t know what to do or need ideas. I look for ideas from blogs, family & friends, the library, and books (the ones I have are listed as resources on the the Things To Do List). Weekly Plan: I sit down once every couple of weeks and plan out activities using my Weekly Function Plan (WeekFunctionPlan2.pdf). I write it in pencil & change what doesn’t work for us. Sometimes I work many weeks out and only fill in what I know I want to do or what is relevant. I try to use a variety of ideas from the resources I listed above. I try to coordinate it with my calendar (like planning a craft time to make a card for an upcoming cousin’s birthday). Daily Schedule: Every day I (usually) update my Daily Schedule (DailySchedule.pdf). I keep it inside of a plastic sheet cover and posted in my kitchen (see pic above). I use a white board marker to write on it what I’m doing each day. I will reference my Weekly Function Plan, but don’t always adhere to it. 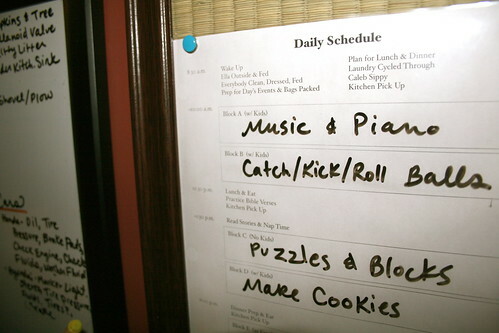 In fact, some days I’ll go through the whole day without doing any of the activities planned on the schedule! You’ll also notice that I refer to time as “blocks” in my two schedules. What that means is essentially “whatever amount of time exists between x and y.” Such as lunch and naptime. Sometimes that’s two minutes, sometimes that’s two hours. Because I don’t want to force a crying toddler through making a marshmallow snowman, I’ll skip the project and put him down for a nap early. See, I’ve learned that mamahood is often about flexibility and letting things go. But that doesn’t mean we shouldn’t have a plan to avoid the insanity. I know I need one. The list of ThingsToDo is AWESOME!!! I printed it up and I am going to tape it on the inside of my pantry door (where I keep all the really important stuff). Thanks!! !